In the early days of the web, Marsha cheerfully launches a home page devoted to her favorite angels and invites them to come and play. They do, and they are not friendly. 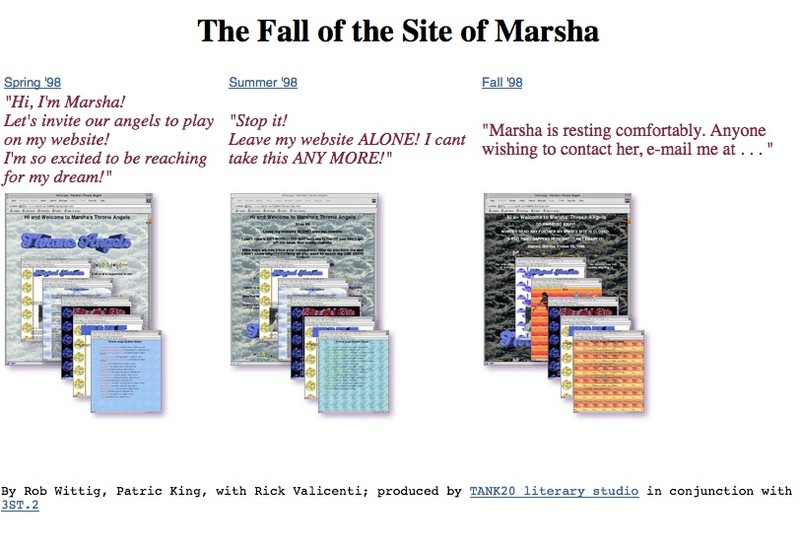 The Fall of the Site of Marsha shows three states of her site, captured in Spring, Summer, and Fall, each getting progressively darker as the angels haunt the beleaguered Marsha, reveal her husband's infidelity (from clues found on the site), and drag Marsha and her home page into madness and Gothic ruin. A thundering torrent of darkness flows through the world and mighty Angels ride the flotsam of lost souls slashing with their spears of righteousness and battling the dim spirits. I have tried to delete some of these awful messages on the message board, but I can't get them deleted. I hope I'm doing everything you told me to, I think I am, but still nothing. Can you help me with this TODAY? I know you're busy, dear.